Former Motherwell boss Mark McGhee has been given a touchline ban totalling six matches by the Scottish FA, BBC Scotland has learned. Scotland assistant McGhee was charged over his conduct towards a match official during Motherwell's 7-2 loss to Aberdeen. The SFA suspended the 59-year-old for five matches. McGhee also incurs an additional one-match ban suspended from earlier this season for breaching the same rule. McGhee, who was in his second spell as Fir Park manager, was sacked by Motherwell at the end of February but is still assistant to national coach Gordon Strachan. 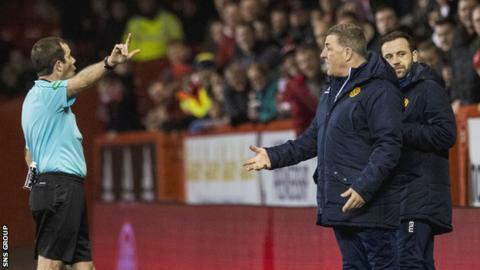 Well's loss at Pittodrie on 15 February was McGhee's third-last game in charge of the Steelmen. Stephen Robinson has been appointed as Motherwell's new manager after being in interim charge following McGhee's departure.